Home News Snedeker Holes 20-Foot Final Hole Birdie To Shoot 59 At Wyndham Championship. 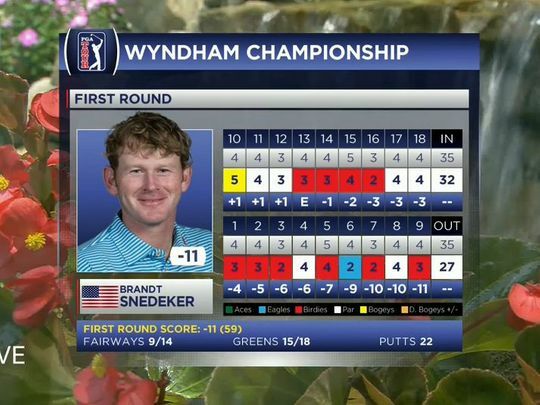 Snedeker Holes 20-Foot Final Hole Birdie To Shoot 59 At Wyndham Championship. 8 months ago by Fatiha Betscher Comments Off on Snedeker Holes 20-Foot Final Hole Birdie To Shoot 59 At Wyndham Championship. 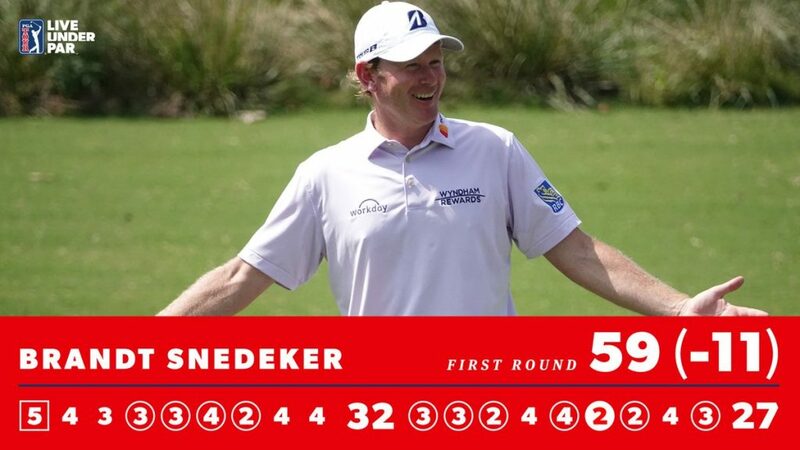 Snedeker, 37 commenced his round with a 10th hole bogey and then cut a swathe through the field with an eagle and 10 birdies from his fourth to 16thholes. But the eight-time Tour winner, including capturing a maiden Tour title in winning the 2007 Wyndham hosted event, missed a birdie putt from six feet at his 17thbefore the excitement of seeing his 59th shot in the $6m event drop at the last. Snedneker’s round included just 22 putts. “To have that putt on the last hole and to know what you are trying to do and that is to step-up there and have a 20-footer and know what it means as I was very aware what was going on, so to knock that putt in was very special,” he said. “Now to know that I am part of a very small club on Tour, and not many people have done this is a really cool feeling right now. “I stood on the 18th tee thinking to myself I will have no better chance than this to shoot a 59 and it’s really cool to now join a very exclusive club. “But after missing the birdie putt on my 17th I had thought there goes my chance to tie -Jim Furyk in shooting a 58 so to make that putt on the 18 was very exciting and this is what we play for. “Though in saying that there was no way I saw this 59 coming but luckily everything clicked today and to do it here and where I won my first PGA Tour and with Wyndham being my long-term sponsor is pretty nice. One of Snedeker’s historic-making shots included ‘slam-dunking’ his second shot for an eagle ‘2’ at the uphill par-4 sixth hole that he was playing as his 15th. in holing-out from 176 yards and not realising he had holed the shot until he arrived at the green. With one side of the hole badly damaged, officials took the unusual step of cutting a new one a couple of feet away. Fellow Americans – Martin Flores, D A Points and Brett Stegmaier – were in the clubhouse sharing second place with rounds of 64. Masters winner, Sergio Garcia was the leading European in birding four of his closing nine holes in a round of 66. USA Ryder Cup captain, Jim Furyk holds the all-time Tour low of a 58 on the final day of the 2016 Travelers Championship while Furyk also has shot a 59.